Thank you so much to those of you who helped with our Teacher Appreciation Lunch - it was really appreciated - and for those of you who were baking or making cards the evening before. Next week there is a Staff Appreciation Lunch, and we'll thank you in advance for that, too. Next week our final MAP testing session begins, and well be enjoying the children's art work all around the hallways on Thursday - thanks to Linda Bockarie, Wendy Welander and Megan Carpenter for the time they have already pout into organizing this. Library Book Return Dates: Please note the following dates for the end-of year return of books to the library. This is so we can take stock of all books for next year. Pool Reminder: Parents are requested to be with their own children if they are at the pool after school or at weekends. This applies to all children Gr 8 and younger. The pool rules are linked here to the parent/student handbook . Pre-3 - Gr 2 Assembly on Thursday May 16: We have a special mid-month assembly for you. Ms. Marje's class will be entertaining us, so please come along to the amphitheater if you have time at 8:30. 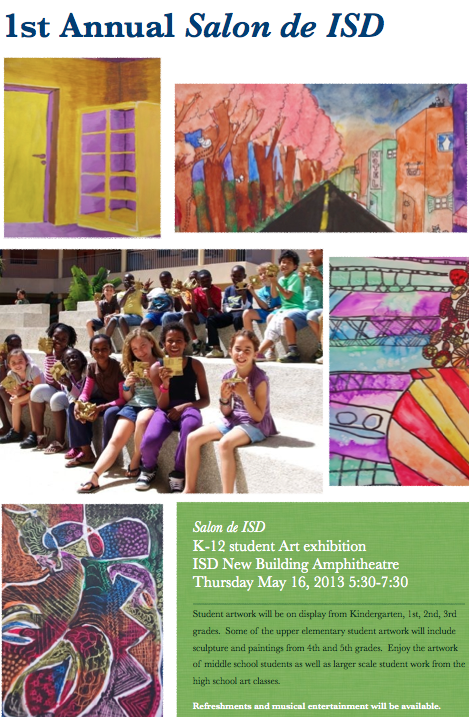 Art Salon: Our first Art Salon will take place next week on Thursday May 16 at 5:30. There will be refreshments, and plenty of Pre-3 to Gr 12 art on view to enjoy.